In search of new ways to bolster revenue growth, some of the most successful hotel companies are creating dynamic digital experience ecosystems. In addition to driving revenue growth, digital ecosystems are delighting customers throughout the guest experience. More importantly, these virtual worlds are allowing hoteliers to have a broader view of the client's lifecycle. Continue reading to learn more about the new emerging digital ecosystem for hotels. Why Are Digital Ecosystems Important? Anyone who has spent any amount of time waiting in an airport can attest that travelers love their smartphones. According to a Smith Micro study, 62% of travelers prefer using their mobile device to purchase or reserve hotel services, instead of face-to-face interactions with hotel staff. However, when hotel guests check in, they don't drop their smartphones off with their keys. Instead, they keep their device with them to access the web and social media channels. Consider the guest who earns points for completing reviews online about their stay at a facility. Or the loyalty program member who chooses to "Check-In" on Facebook on their morning commute to work to earn loyalty points. These are examples of customers enjoying the digital ecosystem while advertising their favorite hotel to their friends. The mobile guest experience is transitioning into one of the keys to commercial success and will trump traditional product innovation. When hotels get the mobile experience right, it creates opportunities to generate innovative revenue streams and differentiate the facility from the competition, including online travel agents. For chain hotels, transitioning from a mobile search-shop-and-book platform into a digital ecosystem isn't an easy task. It involves standardizing technology across all chains, which can be a significant investment for major brands and a tough sell for large franchisers who may not benefit directly from on property revenue. These technical upgrades pose a significant financial hurdle and capital expense for owners, which could include digital equipment upgrades, such as smartphone enabled roomkeys. In creating mobile apps, hoteliers must make sure the app is worth downloading because guests only visit the property a few times per year, which puts an infinite value on delivering a stellar customer experience. Almost every hotel has used mobile technology to bolster the upstream aspect of the travel. With 72% of hotel apps allowing individuals to make reservations, booking and shopping on mobile devices have become staples. Mobile apps provide clear and high returns on investment and provide a low cost per transaction, which makes it an excellent place to enter the digital ecosystem. More and more hotels are developing mobile services designed to enhance the overall guest experience. One great example is Kimpton Hotel & Restaurant Group's Karma Rewards program. This program rewards guests for completing certain actions, like dining at Kimpton restaurants, traveling with pets, visiting the bar for wine hour, or even tagging the facility on social media outlets. Users can get free snacks delivered to their room just by tweeting about their dinner at the restaurant. While mobile technology is the obvious way to evolve and realize the benefits of the digital ecosystem, it's best to cross-link all elements with the brand's broader commercial strategy, including distribution, payment, and even loyalty. Hotels can no longer think of these elements separately. Instead, it's critical for all of these elements to be seamlessly integrated with an intuitive PMS to create and evolve in the digital ecosystem. 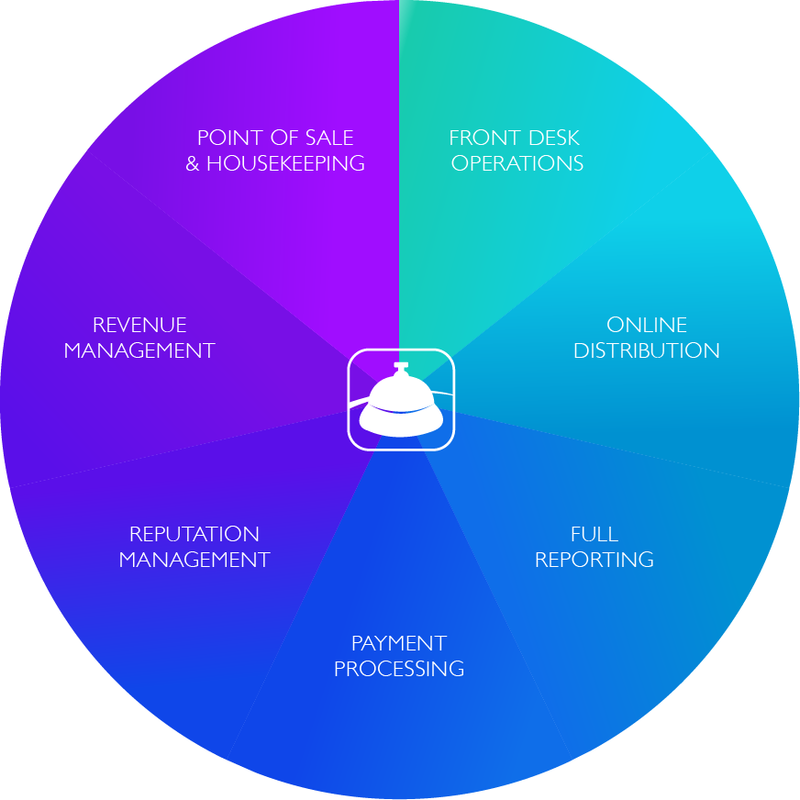 Contact Sales@FrontdeskAnywhere.com to learn how our PMS platform is bringing hoteliers closer to their guests and improving their online reputation.